There have been visual books released in the past for the Shinkyoku Soukai Polyphonica series, but Kannazuki Noboru Illustrations - Shinkyoku Soukai Polyphonica is the definitive collection of Kannazuki's work, with page after page of gorgeous illustrations. I feel like I'm getting spoiled with great art books lately, and this one is no exception. The book starts out with a double sided poster that shows two full length body illustrations of Corticarte. 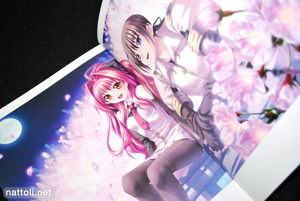 The art works aren't new though, as one was a dakimakura cover illustration. 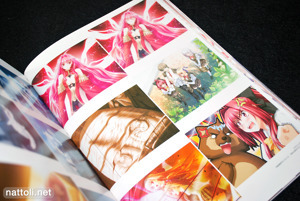 The two page spread illustrations are printed with a tiny amount of overlap, so the art works look complete without bending the book backwards. Most of the illustrations in the front half of the book are from the DVDs and even the DVD art box, so they are the kind of illustrations you don't see as often. 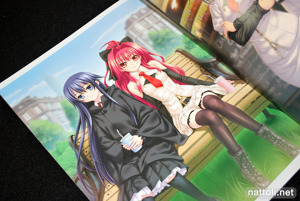 I didn't like the inclusion of 8 pages of in-game CGs. It didn't seem necessary, and even though they are small images to begin with they're piled in 6 pictures to a page. The quality just doesn't measure up with the rest of the art work in the collection especially with the visible pixelation in some images. But that's really a minor complaint, as it doesn't occupy a significant portion of the book. 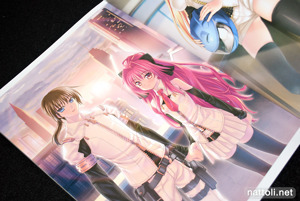 Amazingly, aside from those pages of in-game CGs, every illustration in the book is either presented on a full page or on a two-page spread. Definitely not something I'm used to seeing, even with so many art books. Kannazuki Noboru Illustrations is 128 pages long, with the color illustrations concluding at page 112. There is a small monochrome section on the end, but even the black and white illustrations get the full page treatment. The monochrome gallery runs from pages 111 through 126, which pretty much only leaves room for a short interview page and the copyrights page. There is no index in Kannazuki Noboru Illustrations, instead the image information is printed in a small corner of each illustration. 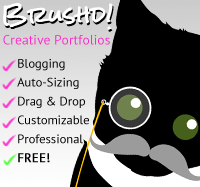 I adore the image you used for your post intro. Definitely a lot of red headed spoiling going on in that book. Mmmm. That's some fine looking artwork you got there. It's mighty purdy! very nice book, may buy if I have the money. 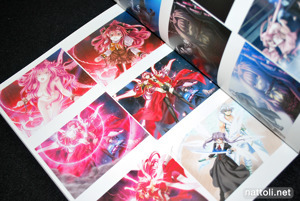 I so want an artbook by Kannazuki Noboru. But alas, I can't get any stuff for the following next 3 months. Am no fan of "Shinkyoku Soukai Polyphonica" but I do adore Kannazuki Noboru's terrific illustration style. Pfft, you weren't looking hard enough! Manly men are everywhere!